ClanPlay chooses Aion platform to launch Good Game social gaming token to over 2 million platform users. 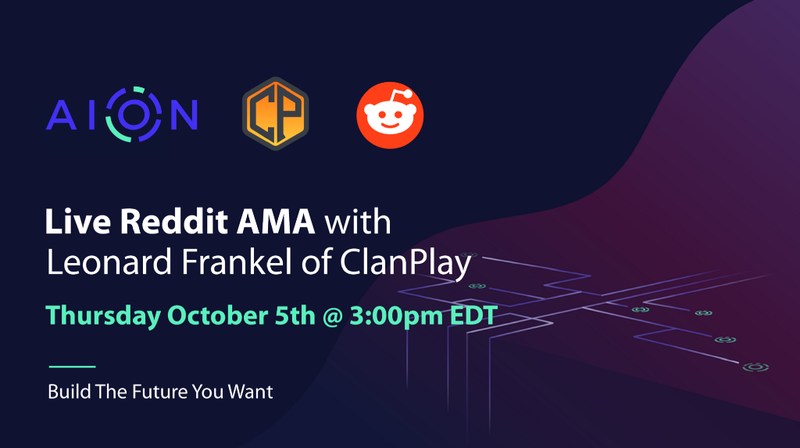 CEO Leonard Frankel to do AMA on Aion Reddit Channel at 3pm EDT Oct 4th. Last week, in a wonderful Venture Beat profile, ClanPlay announced they would become one of the first pioneers on the Aion interoperable blockchain platform, launching the Good Game Marketplace in Q4 2018. The unique marketplace will enable players to monetize their skills by trading in-game services and participating in massive-scale tournaments. Additionally, ClanPlay announced a strategic investment by our venture partners Bicameral Ventures. Bicameral will be the lead investor in ClanPlay’s €2.5 million Seed round and wrote about their investment here. After the announcement, Leonard Frankel — ClanPlay CEO, took a moment to jump into our Telegram Channel last week to discuss his upcoming project in an informal Q&A. He loved how active our community was (thanks everyone) and wanted to do a follow-up session to give everyone an opportunity to dig into the ClanPlay platform, why Aion, the token functionality, the gaming industry or anything else you’d like to know! He will be back on Thursday, October 4th for a formal AMA with our Reddit Community. “Tune in at 3pm EDT and Ask Me Anything” says Leonard as he is excited to share his thoughts on how they intend to leverage their 2 million users to build the world’s first marketplace for in-game actions on Aion. To get you excited, the Bicameral team posted the recap of the Telegram AMA on their blog. ClanPlay chooses Aion platform to launch Good Game social gaming token to over 2 million platform… was originally published in Aion | Blog on Medium, where people are continuing the conversation by highlighting and responding to this story.